Helen Sigur (Helen Nathan)- Winner, MCA "I Dare You" Award, 1980: Happy New Year! Well, my leg STILL isn't completely healed yet.... I have a stubborn little spot about 1/2" x 1/4" that just won't heal over. Just before Thanksgiving, I was supposed to have an MRI of my leg. That didn't happen. Instead, I had a CT scan with contrast of my chest, abdomen and pelvis, which came out clean (so they said) even though the written record shows a "lung cyst" and either a cyst or a hemangioma in my liver, and I found out I have uterine fibroids. They didn't TELL me any of this...I wouldn't have known had I not requested and paid for the records. Anyway, I'm feeling much better since Thanksgiving, and my burn healed really quickly up to the point where it has been stuck since Immaculate Conception. Christmas went remarkably well considering how late I had to prepare for everything since I wasn't able to do ANYTHING much at all until Thanksgiving. A lady from church (thanks, Maggie!) gave me a little kit of Burts' Bees products including some salve that contains comfrey and lavender. I started using that just before Christmas; the comfrey stimulates cells so that they repair faster. When I went home to New Orleans the day after Christmas, Mom gave me some medicine she used when she had cellulitis. That helped within one day to reduce the inflammation and discoloration around my wound, and it has continued to help. Within a couple of days, it seemed like the wound was getting shallower (but still not SMALLER.) 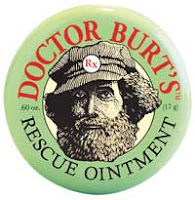 So the combination of the Burts' Bees and the medicine was helping to spur on some new healing since I was stalled for almost 3 weeks without any encouraging signs of healing at all prior to using these. By the time I left New Orleans (Dec. 30) I was able to sleep without a pillow between my legs for the first time since the summer. Prior to that, it hurt a LOT if my legs touched if I tried to sleep on my side and if I put any pressure on the wound at all. The other development since Christmas is that it doesn't hurt if I press around it or even on it (when covered.) Prior to even Christmas Day it hurt, especially in two little swollen spots on opposite ends of the wound. Last night I put a hydrogel on the wound, and it stayed in place all day, even through physical therapy this afternoon, and two games of bowling with Bill and his son Will, whose birthday it is today. So I guess my leg is healing deep under the skin, but it is taking FOREVER. The part that's left was right where I tore off the tape which made the original wound, and that's the same spot where the beams exited my leg, and I would have gotten the concentrated "boost" of radiation in my final week of treatment. My next CT is supposedly without contrast, of just my lungs, in February. I'll finally have an MRI of my leg in May, but Dr. Oskouei said he wanted my leg to be completely healed before that since scar tissue can appear similar to tumor tissue. I started physical therapy on Friday back at Benchmark Physical Therapy on McGinnis Ferry Road. They did such a great job with my shoulder in Fall 2007, I definitely wanted to go back there again. I had to ASK to get the prescription; they didn't automatically offer it to me. It's incredible to me that they don't prescribe PT for everyone who has not been able to have full range of motion in a limb for several months. It just goes to show you that the patient really has to be proactive about their own treatment. I'm still tired from the "holidays" which for me include some pretty heavy workdays. I've got to get my house cleaned up now that I have a reasonable amount of energy. It's making me crazy. At least I got all my laundry done over the past couple of days. Will try to check in again before my next Doctor appointment and post pictures of my leg (now OK for mainstream viewing) and hopefully SOON, one of my leg fully healed with all skin intact! For now, Happy New Year!